Everything You Need for Your Forest Region Adventure! You’ve packed your clothes and sunscreen, but there are some things that won’t fit in that suitcase -– like scooters, ATVs, bikes, kayaks and canoes. We’ve got you covered with some go-to places for outdoor equipment, clothing and gear to make your next outdoor adventure the best it can be. Operating 20 locations throughout the Allegheny National Forest, ASM offers tent and RV camping, as well as cabins and boat rentals, to accommodate all of your recreational needs. Boats, kayaks and canoes are available at Willow Bay and Kiasutha. For prices, call Willow Bay Ticket Booth: 814-368-4158; or Kiasutha 814-945-6511. Reservations for campgrounds can be made through , www.recreation.gov via telephone or internet. The toll-free number: 1-877-444-6777 TTY. Kayak near the headwaters of the Allegheny River. No big rapids here, just plenty of beautiful scenery with a nice current to help carry you along. Travel for miles without seeing a car or house, enjoy the beauty of the river and forest where you have the opportunity to view ducks, geese, and deer along the shoreline. Family friendly kayaking. Beginners can plan a 4-hour kayaking excursion from Boyer’s Crossing paddling back down to Dunbar. For intermediate paddlers looking for a longer day trip, on the river-6-7 hours with a stop for lunch, we suggest a trip from Roulette to Dunbar. 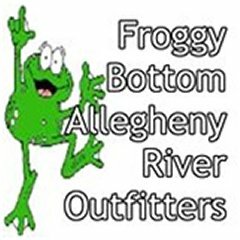 Call 814-558-0843 for additional information or to schedule your kayaking adventure with Foggy Bottom Allegheny River Outfitters. Call us for all your rental needs — we have the toys to play on the water and in the snow! Helmets, equipment and clothing also available. Per sled: 2 hours for $75.00. 4-6 hours start at $125.00 and up. Boats, jet skis, and powerboats for fishing, water-skiing or tubing. Call for boat rental rates. Start at $55.00 an hour, maximum number in a boat 5. Must be 21 years of age and have current driver’s license. Boater safety course certified or our guide will accompany your group. Advance Reservations required for all rentals. Questions? Ask for Tim Slaven. Miles and miles of legal ATV and dirt bike trails open year round at Majestic Kamps & Lost Trails in Rew, Pennsylvania. Trails are well groomed, wooded and hilly. Located in northwestern Pennsylvania, east of Bradford, in the middle of the majestic Allegheny Mountain Region. Privately funded, privately-owned ATV trails and campsites. Ask us about ATV rentals and ATV guided tours. Currently offering two-loops with over 35 miles of wooded technical trails. Motocross play area, Wilderness camping, Pee Wee Motocross track. Snowmobiles and dirt bikes welcome. Approximately 2 hours from Buffalo, Erie, Rochester and Ohio. ***Just ask for the “Majestic Trails Packages” when booking your reservation! Call ahead to check schedule of special events including upcoming Dice Runs. Burdick’s Lodge is located in the North Central part of Pennsylvania in the Allegheny Mountains in beautiful McKean County, Pennsylvania. Hunt on 1000’s and 1000’s of acres of “PRIME” State Lands, Public Lands, and Semi-Private Lands. These superb hunting areas have it all — White Oak and Red Oak, grassy pipelines, food plots, old clear cuts, new clear cuts, open hardwoods, evergreen stands, and swamps. You can hunt deer, bear or turkey. “Fair Chase” hunting guide service, since 1992. Reserve the lodge with or without guide service for hunting, snowmobiling and fishing. Check Our Event Calendar – Plan Now! Plan your next great adventure now! Located between the Allegheny National Forest in Pennsylvania and Allegany State Park in New York, McKean County in Pennsylvania is Trail Central! Download the complete 2019-20 Visitors Guide. Trail Central offers 513,000 acres of outdoor fun. Enjoy scenic driving tours, and over 600 miles of trails for hiking, biking, skiing, horseback riding, ATVing, and snowmobiling. Click here for maps.